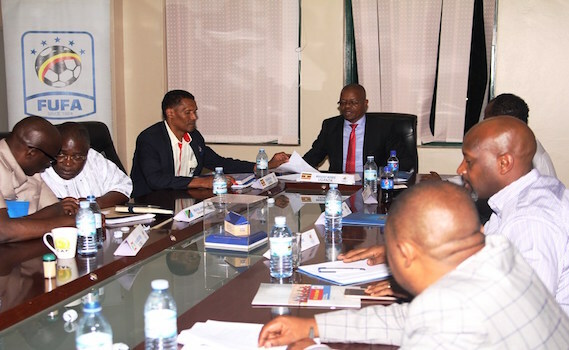 Seven out of the 12 federations that make up the CECAFA, the East and Central Africa football body met in Kampala, Uganda this week to try and came out with resolutions to the ongoing challenges impeding the football association. At the end of the meeting, the regional F.A Presidents came up with a nine point resolution programme that included a constitutions amendment, a call for an urgent CECAFA Congress, call for youth events, clubs, national teams, women and beach soccer though what came to fore was the joint bid to host the African Cup of Nations tournament. It was observed that in the last 40 years of the 60-year old competition, no CECAFA regional member country has hosted the African Cup of Nations. “Joint application by CECAFA and its 12 members is to be made to CAF that the next available Africa Cup of Nations hosting opportunity is provided to a CECAFA member or members (joint bid) subject to fulfilling the AFCON hosting requirements,” the resolution released by FUFA reads. Already the next three AFCON hosting slots have been handed to Cameroon (2019), Ivory Coast (2021) and Guinea (2023). However an opening could be present since Guinea is alleged to be financial unsteady. CECAFA’s wish can only come in the 2025 edition since Ethiopia has made it known they will bid for the continental tournament because of their substantial infrastructural investments. F.A Presidents who attended the crisis meeting included: Rwanda’s Vincent Nzamwita, Jamal Malinzi (Tanzania), Juneidi Tilmo (Ethiopia), Nicolas Mwendwa (Kenya), Hon. Ndikuniyo Reverien (Burundi) and CAF’s newly approved member nation Zanzibar was represented by Ravia Faina. South Sudan, Sudan and Djibouti missed the meeting with apologies. Moses Magogo, the host F.A boss chaired the closed-door meeting held at the Uganda Football Federation Association headquarters (FUFA) at Mengo, Kampala. “As a region, we met to resolve the encumbrances to the development of football development in our CECAFA region. CECAFA needs to be cleansed with better organized competitions, a well-recognized permanent home, an amended constitution, a re-branded entity with fair representation on the CAF Executive Committee,” Magogo told the media during a press conference after the meeting. Tanzania’ federation president Jamal Malinzi was impressed by the step undertaken by the members who attended the meeting. “This brain storming meeting is a great stride taken in the right direction for the development of football in the CECAFA region. There is nothing we have done in secrecy. Nzamwita also explained about the problems that have been affecting the progress of the CECAFA Kagame Clubs Cup. Executive Committee is the top most decision-making organ of CAF, the African football confederation. CECAFA has been inactive and has only hosted two competitions in the past four years. Improvement on all CECAFA competitions with emphasis on the youth events (U-15, U-17 girls and U-20), clubs, national teams, women and beach soccer. Improvement on the technical aspects of the game in terms of refereeing, coaching, sports administration, medical. Ensure a fully re-branded CECAFA to improve marketing and communication of CECAFA. Present a proposal to submit an official bid to host the Africa Nations Cup finals in the near future. Come up with a proposal to fund the headquarters of CECAFA. Lobby for representation of CECAFA on CAF Executive committee.